Cowen, Tyler. An economist gets lunch : new rules for everyday foodies. Dutton, 2012. 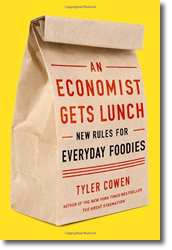 The words “everyday foodies” in the title of Tyler Cowen’s book were what first attracted my interest. Even though I plead guilty to being a “foodie”, I cringe a bit inside when I write or say it. The word has an elitist whiff to it. An “everyday foodie” sounds more down-to-earth and approachable; and much of An Economist Gets Lunch focuses on distinguishing the behaviors of the everyday foodie from those of the food snob and the thoughtless consumer. Cowen does readers and mindful eaters a great service by explaining both the positive and negative effects of America’s food supply chain. He also provides guidelines to help the reader make every meal count, realize that good food is often cheap food, and to be innovative as consumers. If you’ll pardon the pun, the meat of An Economist Gets Lunch begins in Chapter 7 (“Another Agricultural Revolution, Now”). Cowen starts with the revelation that corn as we now know it is the product of progressive genetic engineering, i.e. selective breeding, practiced over millennia by farmers in central Mexico. It was the first “Green Revolution”. It may sound as if the author is a full-throated supporter of Big Agribusiness; but his arguments for carbon taxes set by governments to modify consumer behavior makes it clear that this is not the case. It is ironic that Cowen spends many pages empowering consumers to make intelligent, thoughtful choices about how and what they eat; yet he concludes here that it would be just too difficult for consumers to accurately make choices about what foods are the most or least “green”. Another irony, really a self-contradiction, is Cowen’s suggestion to “minimize the number of car trips” required to support food consumption; and yet throughout the book, he emphasizes the value of increased travel as critical to the education and experience of the everyday foodie. An Economist Gets Lunch is an interesting and informative read in that it opens readers’ eyes to the currently under-reported benefits of our US food supply chain, and the humanitarian value of GMO food crops. But the “food advice” chapters progressively read like lightly edited blog posts, and assume readers will have access to a metropolitan setting like the author’s. Cowen’s generalizations about locavores — “those who eat local foods, either mostly or exclusively” as being driven by a desire for “a feel-good attitude” are also too sweeping, and slightly hypocritical, in this reviewer’s opinion, given Cowen’s high praise for local foods in other countries. An Economist Gets Lunch is recommended, like a good restaurant, with reservations. © Reviewer: Carlton Brown & Ford Library – Fuqua School of Business. Morgenson, Gretchen and Joshua Rosner. 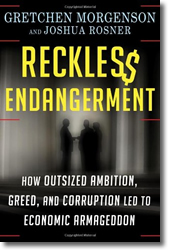 Reckles$ endangerment : how outsized ambition, greed, and corruption led to economic armageddon. Henry Holt and Co., 2011. Why read another book on the housing bubble and financial crisis that led to the recent recession? If you have read the numerous other books released in the past several years and are not familiar with name James Johnson, then that is a reason enough. The other accounts have understated the role of Johnson, the Chief Executive of Fannie Mae from 1991-1998. Gretchen Morgenson, a New York Times reporter, and Joshua Rosner, an adviser to the financial industry, target Johnson as the architect of the private-public partnership to promote the home ownership drive. Interestingly, Johnson and the other players in the book draw strikingly familiar parallels to Ayn Rand’s characters a half century ago. Rand demonstrated what can happen if unscrupulous characters in the private sector and the government form an alliance. Although Rand’s characters are fictional, unfortunately Reckless Endangerment’s are not. A Nobel prize winner, university faculty, and industry insiders explore the whys and wherefores of the current “Great Recession” in these Top 5 new titles in Ford Library. Freefall : America, free markets, and the sinking of the world economy. by Joseph E. Stiglitz. W.W. Norton & Co., 2010. Nobel Prize winning economist analyzes the global economic crisis and describes what should be done to promote growth and stability. Crisis economics : a crash course in the future of finance. by Nouriel Roubini and Stephen Mihm. Penguin Press, 2010. NYU Economics professor Roubini (Dr. Doom), who forecasted the economic crisis in 2006, explains that financial systems are inherently prone to collapse and recommends change to bring transparency and stability to financial institutions. Paper fortune$ : modern Wall Street : where it’s been and where it’s going by Roy C. Smith. St. Martin’s Press, 2010. NYU faculty member and former Goldman Sachs banker tells the story of Wall Street and the people who shaped it from a boutique business to a global industry. How markets fail : the logic of economic calamities. by John Cassidy. Farrar, Straus and Giroux, 2009. Traces the rise and fall of free market ideology, including how the rational pursuit of self interest created the economic crisis, and how it must be replaced by reality-based economics that recognizes human irrationality and interdependence. The crisis of capitalist democracy. by Richard A. Posner. Harvard University Press, 2010. Circuit Court Judge and Chicago School economist analyzes the economic collapse and questions the ability of government to respond effectively to the Great Recession. Ariely, Dan. 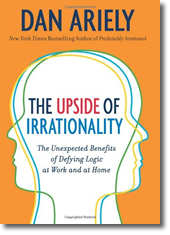 The upside of irrationality : the unexpected benefits of defying logic at work and at home. Harper, 2010. Fuqua faculty member Dan Ariely has written a second best-selling book about the biases that influence our behavior and answer the question – Why do we act the way we do? As in his previous book, Predictably Irrational, Prof. Ariely describes experiments that illustrate basic principles of behavioral economics, such as adaptation and empathy. He discusses biases, such as the IKEA effect — why we overvalue what we make by hand – and the Not-Invented-Here bias – why we overvalue our own ideas. Readers learn how a sincere apology can reduce anger; how employees value meaningful work; and why large bonuses do not improve performance (hear that, Goldman Sachs?). People who are aware of their biases make better decisions. The Upside of Irrationality is written in a conversational tone, peppered with charming and humorous stories about Ariely’s family and friends. Ariely also draws on his experiences as a burn patient to explain his outlook on life. A personal story and an engrossing read, the book feels like a long discussion over dinner. Upside is one of the best books of the year. The Upside of Irrationality is also available in Ford Library as an audiobook. The lecture, “At the Brink: The Future of Lending, Credit and Leverage,” will be held this Saturday at Duke University’s Fuqua School of Business. Leading Wall Street figures will discuss the state of lending, credit and leverage at 2-4 p.m. Saturday, Feb. 27th in Geneen Auditorium. This is the 2nd of a four-part series and represents a joint collaboration between the Fuqua School of Business and McKinsey Quarterly. The series will consist of forums on the following areas: energy, the financial system, globalization and business education. Fox, Justin. 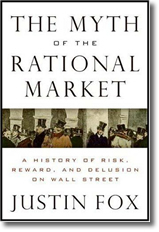 The myth of the rational market : a history of risk, reward, and delusion on Wall Street. Harper Business, 2009. Anyone who has taken a basic course in economics or finance knows that this joke alludes to the efficient market hypothesis, which holds that the market is always right. Prices can’t be wrong. If they are, someone would seek to profit from the error and correct it. The decisions of millions of rational investors, all acting on information, provide the best judge of an asset’s value. This theory is the basis of a risk management and pricing system that underlies our global economy. But is this theory correct? Time columnist Justin Fox tells the story of the faculty members who designed complex financial theories. He focuses on the academic debate, explaining the theories of economists, such as Modigliani, Miller, Markowitz and Merton. Academics constructed models for managing uncertainty, which inspired the first index fund, the rise of derivatives and modern portfolio theory. Then in 2007 asset markets throughout the world collapsed, proving that the ideology was incorrect. After the market crash of 1987, Robert Shiller called the efficient-market hypothesis the “most remarkable error in the history of economic theory.” Yet even after the disaster, the theory continued to thrive, only to contribute to the latest crash. Recently, Paul Krugman called the hypothesis “beautiful, comforting and, above all, lucrative.” It is not going away anytime soon. Schweizer, Peter. 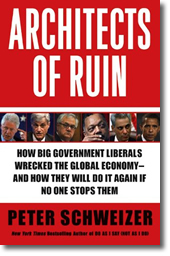 Architects of ruin : how big government liberals wrecked the global economy–and how they’ll do it again if no one stops them. HarperCollins, 2009. We experienced the dot-com bubble when the market crashed in 2000 due to overconfidence in technology. Investors took money out of the stock market and purchased real estate. It was a better investment opportunity thanks to low interest rates, risky mortgages, and relaxed lending standards. But, economists have different perspectives on the basic questions of what caused the recent housing bubble, and also what to do about it. Peter Schweizer argues the cause was liberal social policy, not a market failure. Shell, Ellen Ruppel. 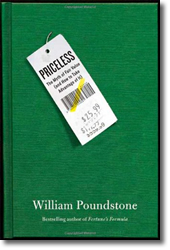 Cheap : the high cost of discount culture. Penguin, 2009. Anderson, Chris. Free : the future of a radical price. Hyperion, 2009. An outlet mall in Philadephia rings in four times as many visitors as the Liberty Bell. Colonial Williamsburg can’t hold a candle to the Potomac Mill outlet mall. So writes author Ellen Ruppel Shell in the book Cheap. Outlet malls are located 25 to 100 miles from a metropolitan area as a deliberate strategy. Not only is the land inexpensive, but the inconvenient location connotes cheap and America has a love affair with cheap. 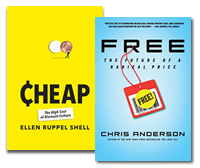 Ruppel Shell covers a wide range of topics, including the history of bargains and markdowns, the effects of discounting on durability and craftsmanship and the psychology of discount decision making for the shopper. The hunt for bargain prices has led to a host of problems, including an unsafe food supply, global poverty and environmental devastation. Consumers have paid a high price for cheap goods.